Home » Articles » Local » Were The Three Wise Men Ninja Wizards? Were The Three Wise Men Ninja Wizards? The three wise men are a staple of Nativity scenes and Christmas stories worldwide, but along with gold, frankincense and myrrh, did they also carry samurai swords? Herod and various other forces of evil. “It’s the greatest story never before told,” said author Sean Leary, who didn’t divulge how much time he may have spent in Colorado or Washington while writing The Arimathean. Leary will be signing copies of his book and others from 1 to 3 p.m. Saturday at Caribou Coffee, HyVee, 7th Street and John Deere Road, Moline. But is it entirely a pipe dream? Is there any truth to the claim? Should people begin dressing their Nativity characters like Snake Eyes? 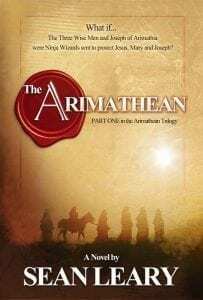 The Arimathean is available at online bookstores worldwide and at www.seanleary.com, and www.thearimathean.com.